When a soul incarnates into this life, the Date of Birth determines the stage of the cycle of life when this event occurs. Your Ruling Number, Life Path Number or Soul Purpose number as it is variously referred to is the key to your cycles of development and maturity. When first your are born, there is a need to allow time to get used to the new environment. You look at it with wide eyes and cannot understand why it is that you cannot do what you used to do - in your previous existence. What am I doing trapped within this tiny human body. To allow time for assimilation with each of the four human functions the new entity is given 4 developmental cycles - Emanation (spiritual), Creation (thinking), Formation (feeling) and Manifestation (doing). Each of these stages is allowed a 9 year developmental period, but where you commence within these cycles in this incarnated experience, is dependent upon your Soul Purpose number. To calculate your Soul Purpose number see the page Calculate your Soul Purpose. My Soul Purpose number is a 12. On the chart below I have identified my Path Number at birth with a coloured square. Life Path numbers preceding that time are experiences that I have brought with me. 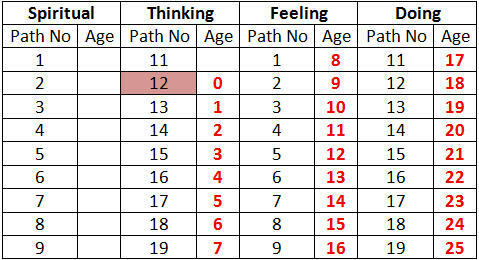 Once I have identified my starting Path Number then I can put my age in the box alongside to show the influences year by year. This means that I entered this life in a year that has a 12 Life Path number. This is the second number on the Thinking cycle of development. 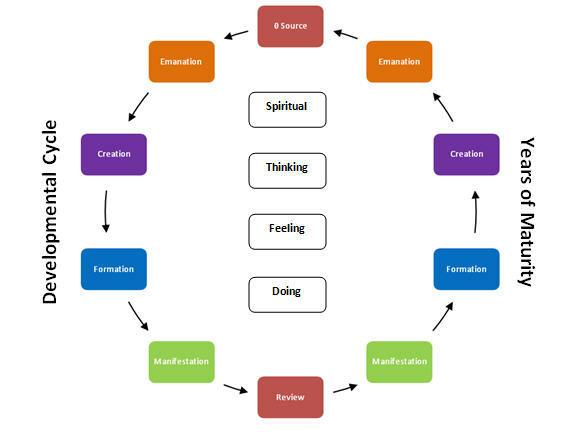 I bring with me all of my experiences of the first Spiritual cycle and also the first number of the Thinking cycle. I then progress each year following the cycle of growth. At the age of 7, I complete the developmental cycle of Thinking. I then commence the Feeling cycle. I experience this influence through my youth and adolescence until the age of 16. I then move into a Doing cycle for 9 years from the age of 17 to 25. At that time I think I know everything. Calculate your Soul Purpose number. Prepare a chart like mine above, with the 4 cycles with 9 Path Numbers each. In the Age box alongside your Soul Purpose number enter 0 (your age at birth). 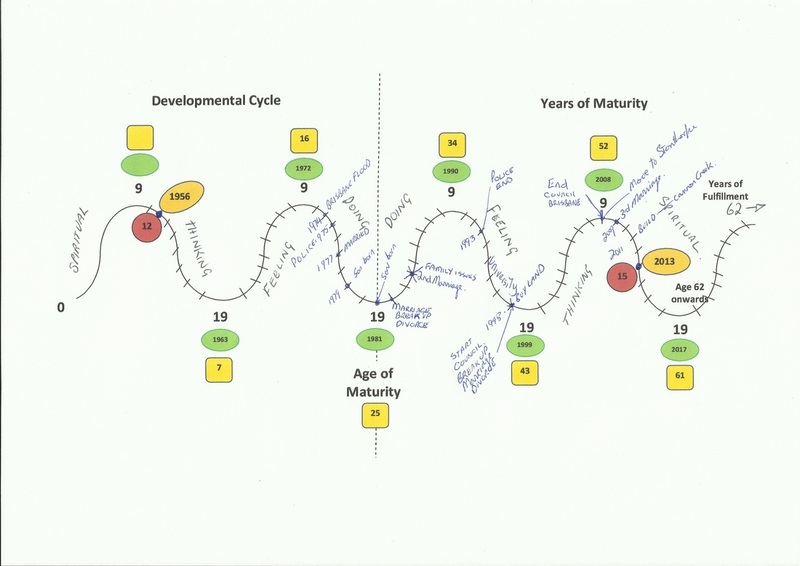 The diagram below shows the pattern of growth through the Developmental Cycle and then there is a review before you commence your Years of Maturity Cycle. The Years of Maturity move in the opposite pattern to the Developmental Cycle - moving through Doing to Feeling, Thinking and then Spiritual. The chart below shows my Years of Maturity, commencing at the age of 26. At the end of the first cycle of maturity, I have been outwardly focused - it has all been about ego - for 9 years. The end of the first cycle is the year of the Path of the Hermit. This is when you start to internalise things and consider the effects of your aggressive, ego behaviour. This is the first mid-life crisis point. Through the next 9 year Feeling cycle, you are more vulnerable emotionally, possibly more sympathetic and empathetic. Perhaps you just hurt more. At the age of 43 I come out of this phase and hopefully I am ready to think a bit more about what's been going on. From the age of 44 to 52, I am more inclined to think about what I feel and do. From the age of 53 to 61, I am more inclined towards being community minded and spiritual. At the age of 62 I move into the Years of fulfillment. Everything in my life to this point has been about preparing me for this time. I now have the opportunity to be the master of my Life Path and fulfill my Soul Purpose. The Developmental Cycle is a training ground. Kindergarten for the soul. The Years of maturity are secondary and tertiary education. The Years of Fulfillment are about implementing the true essence of your Soul Purpose. How well have you learned and applied yourself to the lessons that life has thrown at you? The word "equanimity" means "the quality of being calm and even-tempered; composure." At this stage of life the quality of equanimity is a good measure or indication of mastery. To calculate your Years of Maturity, prepare another chart with the 4 cycles of Doing, Feeling, Thinking and Spiritual with 9 years for each cycle. 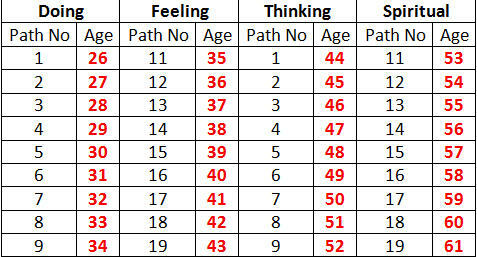 Continue on from your Developmental Cycles chart and write your age alongside each path. Note that the Path Numbers go from 1 to 9 and then 11 to 19 and repeat. Below is a document that you can print out with the blank charts, so you can calculate your cycles. It is interesting to contemplate your life. The events that occurred as you progressed through the influence of the different cycles. How does yours match? Does this analysis give you insights that you had not been aware of before? If you would like to share anything with me, then an email would be appreciated. There is still more to be considered. 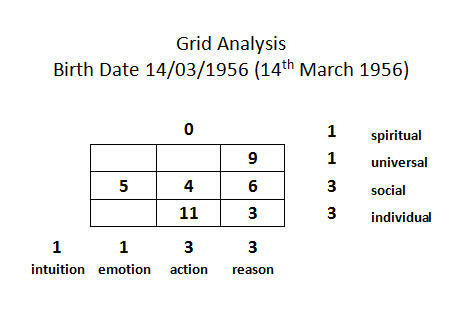 If you have read my page on the Gifts & Talents, then you have already been introduced to Grid Analysis. If not then you need to go there (Gifts & Talents) and develop the grid of your birth date. The grid below shows the distribution of my birth date digits on the grid along with the count for each row and column. In your developmental years, the influence of each cycle is pure - there is no complexity. In your Years of Maturity, you are working through issues according to your dominant and non-dominant human functions (modes of behaviour) and planes of activity. In the first 9 years of your Years of Maturity, the Doing cycle, you will be influenced by the dominant modes and planes. In the second 9 years of your Years of Maturity, the Feeling cycle, your non-dominant modes and planes will rise to importance as you seek to be a fully functioning entity. In the moment between the end of the Doing cycle and the beginning of the Feeling cycle, you experienced a review. This aspect of Human nature is represented by the Tarot card known as the Wheel of Fortune. In the imagery of this card there is a wheel turning - weighing and seeking balance. On the Rider-Waite Tarot card the imagery is very Egyptian with the serpent Typhon displayed on the Wheel. At the four corners of the card are the four entities a man, a lion, an ox and an eagle. These same four creatures are found in the corners of the final (22nd) Major Arcana card know as the World. These four creatures can be seen to represent the four human functions that are being weighed up, at this mid-point, to see which is lacking and needs further development. The 9 years of the Years of Maturity Feeling cycle is when these non-dominant functions are given the opportunity to develop. In the example of my grid (above), it is not as simple as some, as I have equal or balanced scores. So in my Years of Maturity Doing cycle, I will be influenced by Action and Reason on the Individual and Social planes. After my review and turning inwardly considering my life, I will be more inclined to develop my Intuition and Feelings and operate a bit more on the Spiritual and Universal planes. At the end of these two periods, the Thinking phase of the Years of Maturity comes around. My experience will allow me to put a bit more thought into my actions and feelings. During this 9 years I will be striving to achieve under the influence of the base number of my Soul Purpose number. This is a single digit number. So, as I am a 12, then the influence for me in this phase is a 2. The final phase of the Years of Maturity, the Spiritual cycle, is influenced by your Soul Purpose number. Those people who have a single digit Soul Purpose number (1 to 9) get the opportunity of 18 years of living that influence. Those people who are older souls with a double digit Soul Purpose number (11 to 19) have 9 years in their Comfort Zone before moving up a notch in the Spiritual Years to fulfill their true purpose. For example, my chart shows that I will have 9 years under the influence of a 2 and then 9 years under the influence of the 12. In the Years of Fulfillment (the rest of your life), it is full on exposure to living your life according to the theme of your Soul Purpose. At the end of this process you will experience Judgment before you return to the Source (Nothingness) from where you came. Judgment is the process of determining how you have lived your life. Will you return again to repeat on the same level or have you fulfilled your purpose? In your next incarnation will you progress to the next level or will you come back and do it all again in some other guise. Below is what I refer to as a Bio-Chart of my life pattern. The 9 year paths of the cycles show like railroad tracks on the wave pattern. On this chart I have identified key (significant events) of my life. Then I have looked for patterns of similar activity. In what years are the highs and lows of my life? This kind of analysis can help me to understand the true lessons that I was intended to learn from a particular experience. Below I have provided a template of the Bio-Chart for you to print out if you wish to analyse your own experiences. In the yellow square boxes enter your age. In the green oval shapes enter the year. The first things to plot on the Bio-Wave are your year of birth and where you are now. Then look for other significant events - were you injured at some time, get married, have children, get divorced, achieve success or otherwise in your work, other relationships, illness. Now start looking at years influenced by the same numbers as those events and cast your mind back to what happened in those years. Do other events now strike you as being more significant than you previously considered? Do you show evidence of managing and handling similar events and years in more mature ways? Have you grown or remained stuck in your model? Do the same tests and experiences keep coming back at you? Consider the theme of your Soul Purpose. Can you see this theme running through your life? Can you now understand better, why things have happened the way they have? How responsible and involved are you in the reasons for the way things have happened? If you would like to share any of your insights from exploring this analysis then please send me an email about your experience. I appreciate your confidentiality and will find your feed back interesting.